With EastComfort Romania, you have apartments in Bucharest, which are an alternative to Bucharest hotels. Here are displayed more than 50 quality hotel apartments for short term in Bucharest. This 2 room apartment can offer accommodation for two people, wether couples or business travelers. Its open living room is decorated with modern furniture, with comfortable sofa and armchairs, wood glass coffee table and bookcase, providing the perfect place for a friend or partner meeting. The high-tech accessories will providing an enjoyable lodging even to the most exigent couples. The sunny bedroom is equipped with a comfortable queen sized bed and decorated in shades of black and red, while privacy hasn't been forgotten, providing a great romantic environment. The kitchen is fitted for everything you might need to make a full meal (fridge, cooker, microwave). 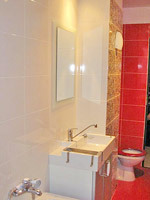 The bathroom is completely accesorised with bathtub, lavatory and shower. The location of the apartment provides easy access to restaurants and discos nearby. All facilities, cultural and commercial centers are few steps away from this flat: the National Theatre, the Romanian Atheneum, museums, cinemas, stores. Dine-in the city will rest as a tasty memory, while clubbing as a winsome one.